It's hard to get the info out regarding Born-Free because every year we change stuff up to make it better and more fun. It's not like a regular show that's the same deal every year...you just show up and it's over. Between the giveaway promo's, invited builders & guests, videos, sponsor & vendor info, art, merch, music and general show changes it's a lot to process. *Today the most important thing to understand is how the BF7 Grass Pass early admission band works and why you need it. The Grass Pass band is designed for the rider to enter the BF grounds without waiting in a line , without having to get off their bike park and pay..then start it back up and ride in. Also a huge plus is being able to have your bike inside the show grounds for easy access. Hang out with your friends and BS about what we all love...motorcycles! Remember its a bike show and we your bikes inside the grounds and to be part of the show. Any bike parked inside the show grounds is eligible for an award and there are several to cover all styles of bikes. In fact the Best in Show winner we be selected from the crowd. The Grass Pass bands are only $ 10 bucks and if you have a passenger they need one too. The regular gate admission is only $ 10 bucks so there is no up charge for the Grass Pass its simply for the riders convenience and to help us keep the traffic moving. Lastly this is the only way to guarantee that your bike is on show grounds and part of the action. You can take your chances to just show up and pay at the gate but if we are full you will need to park in the parking lot and just walk in. The Grass Pass bands are open to all bikes. 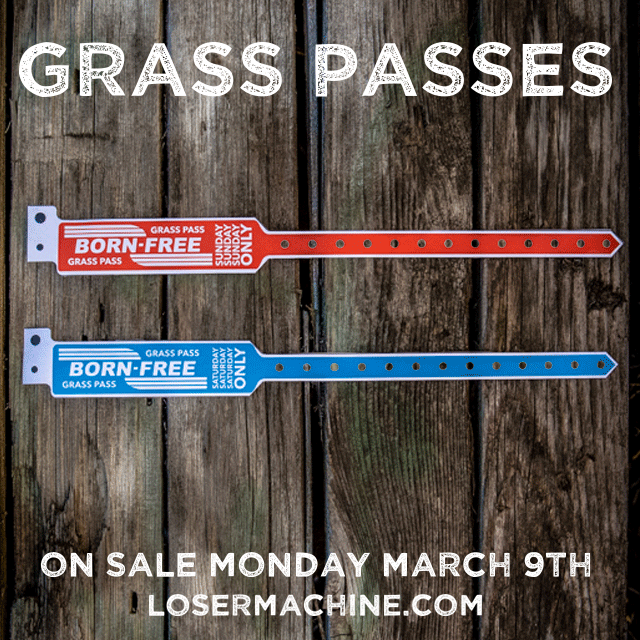 If you are riding to Born-Free do yourself a favor and buy a Grass Pass...You can thank us later. To buy online visit http://www.losermachine.com/collections/born-free Don't Delay..Online cut off is coming soon!! See you all next month.